Evidence that Singapore has far more than the officially claimed 24 Boeing F-15SG fighter aircraft has emerged, although the precise number of airframes has yet to be ascertained. The FAA registry shows that eight Boeing F-15SG aircraft were registered to Boeing on 6 August 2014. The aircraft bear registrations N361SG, N363SG, N366SG, N368SG,N373SG, N376SG, N378SG, and N837SG. Over the years industry observers have come to share the belief that the true number of aircraft is probably 32 - not 24 - mainly owing to the range of registration numbers on Singapore air force registered F-15SGs. Moreover, on a tour of Korea Aerospace Industries’ (KAI) Sachon factory in 2011, Flightglobal observed the forward fuselage assembly of an F-15 labelled “SG28.” KAI is a key contractor in the F-15 programme. Combined with aircraft sightings in recent years, it is feasible that the eight F-15SGs registered on 6 August push the size of Singapore’s fleet of the type to 40 aircraft. Singapore and Boeing, for their part, have adamantly maintained that the official strength of Singapore’s F-15SG fleet is 24 aircraft. Nonetheless, it is impossible to escape the view that the true size of the fleet is greater. 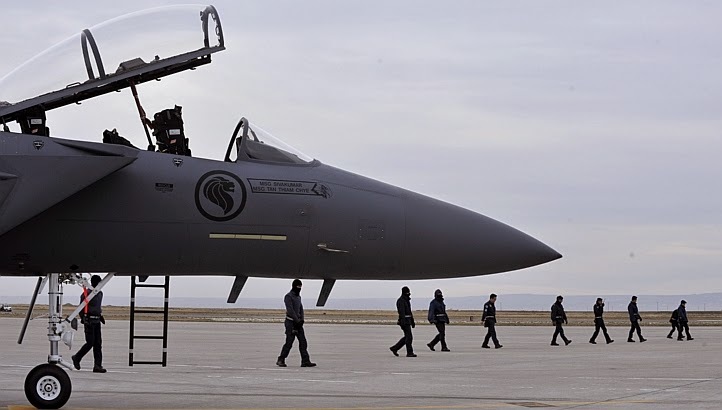 At the recent Pitch Black exercises in Australia, defence observers noted that some F-15SGs showed signs that registration numbers had been painted or taped over, possibly a tactic to obfuscate the true size of the fleet. Another element of evidence about additional F-15SGs is buried in the Federal Register from 17 April 2013, which indicates that Singapore may obtain additional examples through the direct commercial sale route. The registry entry pertained to the acquisition of additional Raytheon AIM-120C7 AMRAAM missiles, but referenced additional aircraft as well. If Singapore has 40 F-15SGs, the country’s fighter fleet numbers about 126 aircraft. Flightglobal’s World Air Forces directory shows that Singapore also operates 60 Lockheed Martin F-16s and 26 Northrop F-5s. The country plans to upgrade the F-16 fleet, and replace the F-5s with the F-35 – the country has indicated a preference for the short take-off vertical landing F-35B variant. Singapore’s secrecy about its F-15SG fleet could stem from the fact that the type is, by a very large margin, the most effective combat aircraft in Southeast Asia – especially coupled with the high quality of Singapore pilots.